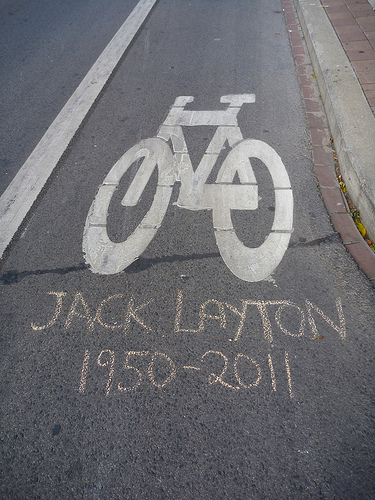 Now The Details: Jack Layton's Obit: An Excuse for Bashing Leftwing Bias in the Media? Jack Layton's Obit: An Excuse for Bashing Leftwing Bias in the Media? The outpouring of sadness and regret for the death of NDP leader Jack Layton has been remarkable. Layton was a unique politician, a man of the left whose integrity and passion for the working class was in the best tradition of English Canadian socialism. Less remarkable is the nasty and mean-spirited attacks by The National Post and Sun Media. It's too soon for them to attack Layton as they did when he was alive. So they are going after the other media and especially the CBC, mostly for its alleged socialist tendencies dressed up as eulogies. Now there may have been a few reporters who got caught up in the emotion of the story. And not all of them were on the CBC. He just ran the most effective campaign in Canadian political history. He wiped out the separatist vote in Quebec, pulling it almost entirely to the NDP through a combination of his own charm and the idea of social justice - still a major draw in French Canada. He pushed the Liberal Party into third place. He made the NDP the Official Opposition in Ottawa for the first time in Canadian history. He died before he could realize his political ambitions for himself and the party. Those are compelling story lines for any newsroom. Layton had been diagnosed with prostate cancer and just before the election was called, he had a small fracture in his hip that required surgery. Despite those ailments, he ran a brilliant campaign. Three weeks ago he called a news conference to announce that "another" cancer - never identified - had been found. So his death was sudden but not unexpected. But it had all the hallmarks of a great journalistic drama. If you were to write a focus statement about Layton's death, it had all the emotion necessary. And Canadians always have enormous sympathy for an underdog, especially when he dies unexpectedly. Terry Fox is also a similar sort of national hero. He was the one-legged cancer victim to tried to run across the country but died en route. Canadians identify intensely with Terry Fox and I think they will with Jack Layton as well. Has the media been pro-Layton? Well, yes. The media has also been given a story that has enormous emotional potential. It is, at the same time, sad and ironic. And that fits the national psyche better than any nasty tone that some media are trying to evoke.